ATAM & ORANGETREE brings back its premiere Turkish-Australian NYE event at The Renaissance Piano Room. Tickets will be sold fast so get in quick to avoid disappointment.
? 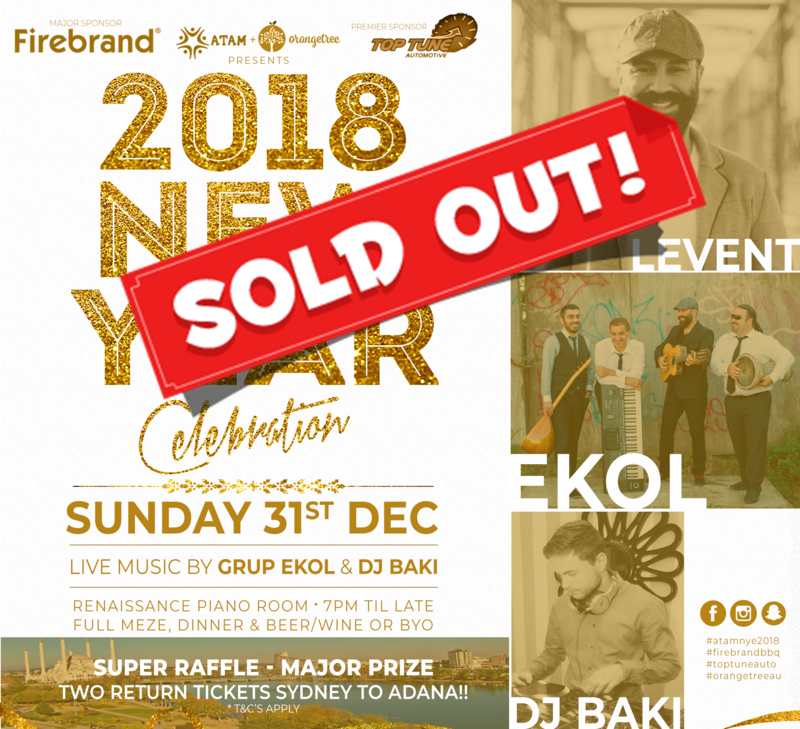 Our lineup of entertainment includes Sydney’s favourite Turkish band EKOL with Dj Baki and other surprise guests!! ✈✈ Guests will have the opportunity to win TWO RETURN TICKETS to TURKEY + much more in our super raffle draw!! Plenty of kids activities will be available throughout the night. Set menu includes full meze, dinner, and unlimited beer/wine & soft drinks. BYO is available.
? Standard tickets are $90pp. Kids (6-11) half-price. Kids 5 and under free. Limited VIP tables available at $110pp. This is a fundraising event with all proceeds going to ATAM Inc.
Special thanks to our Major Sponsors Firebrand BBQ and Premier Sponsors Toptune Auto. For our gold and silver sponsorship packages please contact Bulent Ada on 0403174721. Full meze, dinner, unlimited beverages.